Experts argued against the notion that polls show Democrats already in position for a historic wave in November's midterm elections at the American Enterprise Institute's biennial Election Watch on Wednesday. AEI senior fellow and moderator Karlyn Bowman punctured some popular narratives about election trends in America. She said the popularity of socialism has been overblown, with polling showing it to be unpopular compared to capitalism. Meanwhile, those on the right may be overplaying the value of Supreme Court Justice Brett Kavanaugh's confirmation in rallying their base, she said, citing a Pew poll that found more Democrats considered the Court a top issue. Democrats have seen a larger increase in enthusiasm following the Kavanaugh fight, with Bowman citing polls showing a 10-point enthusiasm advantage for Democrats. But Bowman also noted a Harvard-Harris poll finding 69 percent of respondents consider the Kavanaugh hearings a "disgrace," and so it's not clear if either party will benefit. A majority in both parties disapproved of the Senate's handling of the hearings. Kavanaugh's effect on midterm elections is difficult to account for in polls, especially when local factors come into play. The Democrats' dramatic displays in the Senate hearings to try to stop Kavanaugh appear to be hurting some Democratic incumbents, such as Sen. Heidi Heitkamp (N.D.), who voted against him. The fact remains that Democrats' lead in the generic ballot is trending toward being big enough to create the much-discussed "blue wave" of Democratic election victories, according to the experts. Sean Trende, senior elections analyst for RealClearPolitics, said Democrats on average lead on the generic ballot by about 7.5 percentage points, although FiveThirtyEight's model shows Democrats' advantage at 8.3 points. Democrats are in position to take the House if those numbers held on election day. 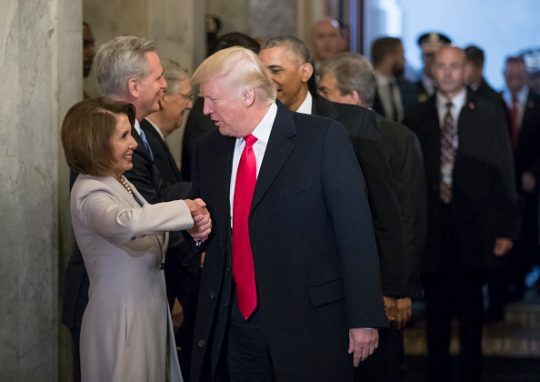 One worrying sign for Republicans is that President Donald Trump's approval numbers are similar to Barack Obama's in 2010, when Democrats suffered historic losses in both houses of Congress. Trende said presidential job approval is the most important single factor for House midterm elections, but he noted the high variability from election to election. Specifically, Trende argued Democrats suffered in 2010 because they had 40 representatives in districts Republican candidate John McCain won in the 2008 presidential election. Since Republicans only have about 25 congressional seats in districts Democratic candidate Hillary Clinton won in 2016, they have considerably less exposure and therefore are not likely to be as affected by Trump's approval rating as Democrats were by Obama's. Michael Barone, longtime co-author of The Almanac of American Politics, pointed out how a statistically tiny piece of the electorate decides the races that turn Congress one way or another. Thus a generic ballot lead is a good indicator for Democrats but may not be determinative. That bears out especially in the Senate, which Barone said is "unusually favorable" to the party with the White House this year. Governors' races are almost the opposite, said John Fortier of the Bipartisan Policy Center's Democracy Project. Republicans have many governorships in states that lean Democratic, so Democrats expect to make gains. But some of their gubernatorial candidates are risky; Andrew Gillum in Florida and Stacey Abrams in Georgia are progressives who would rocket into being national figures if they managed to win, AEI's Norman J. Ornstein says, but they are running against the political grain in their states. Florida is historically a small-government, low-tax state even though it's a swing state in presidential elections. Georgia has been a reliably red state. Some Democratic challengers are more of a sure bet to pick up governorships in states such as Illinois and Michigan. With Republicans defending many more governors' mansions (33) than Democrats, Fortier said Democrats were likely to improve on the mere 16 governorships they currently hold. The change may not be extremely dramatic, owing to the popularity of several blue-state Republican governors, such as Charlie Baker in Massachusetts. Ornstein said an "X factor" playing out right now in some key races may be Hurricane Michael. Currently a Category 4 storm making landfall on the Florida panhandle, Michael is just the latest hurricane to play a role in Republican governor Rick Scott's tenure in Florida, and it may be the final test as he finishes his campaign for Democratic senator Bill Nelson's seat. So far, Scott's leadership during storms has strengthened his image among Floridians. The race to replace him is also set to be affected by the storm—Gillum, the Democratic gubernatorial candidate, is the mayor of Tallahassee, which will likely face Michael's hurricane force winds and heavy rain. Looking toward the aftermath of the midterm, Henry Olsen of the Ethics and Public Policy Center said he expects both parties’ internal fissures to deepen if Democrats pick up seats. He said the Democratic establishment is "still in denial" about the anti-establishment movement in the party, which will hurt party leaders as they go against their base by refusing calls for Trump or Kavanaugh to be impeached, as House Minority Leader Nancy Pelosi (D., Calif.) has done. This contradicted Ornstein's analysis that the progressive shift among Democrats was being directed by the establishment, with figures such as Democratic socialist Alexandria Ocasio-Cortez receiving attention but having little power. Ornstein said that Democrats could have trouble deciding on leadership positions with an infusion of young members into a party currently led by representatives in their 70s and 80s. Olsen said Republicans would also have an internecine battle if they narrowly lose the House. In his view, GOP donors in wealthy suburban districts would be furious to have Democrats representing them. "I expect what you'll find is a high-income revolt, that they will want a kinder, gentler president to win back their neighborhoods for what they consider to be their territory. And there will be tension in the Republican Party over that," Olsen said. This entry was posted in Politics and tagged 2018 Election, Brett Kavanaugh, Democrats. Bookmark the permalink.